Just two more weeks until the Giant Jamboree! and badges must be worn at all times. We recently sent a letter to all iGEM instructors explaining this. a copy of this letter is attached at the end of this newsletter. Team wikis will be frozen on Friday October 17 at 11:59PM EDT! Do not wait until the last minute to update your wiki and remember to that all wiki content (code, files, etc.) must be hosted on 2014.igem.org. * With no regionals, everyone has the same wiki freeze deadline. That is 3x the traffic as last year. Finish your wiki early! * iGEM 2014 is on a NEW server. Don’t get caught in any issues. Finish your wiki early! For more information visit the Wiki How-to Page! Judging forms will be frozen on Friday October 17 at 11:59PM EDT! Judging Forms allow you and your team to communicate your achievements with the judges. When judges evaluate your team, they will look at your wiki, see your presentation and come visit you at your poster. Be sure to fill your Judging Form before October 17 to be eligible for award selection. Access your Judging Forms here. Teams will be able to rehearse their presentation at the Hynes Convention Center on Thursday afternoon. There are a limited number of time slots available so reserve your spot! Note: Additional rooms may be added in the coming weeks. HQ at iGEM dot org for assistance right away. The overview of the Giant Jamboree Schedule is now available. Please stay tuned for presentation session updates. Remember: No Stickers! Stickers are not allowed in the Hynes Convention Center. However, feel free to bring any other types of iGEM goodies to share! Have team members who didn’t register but are now able to attend the Jamboree? 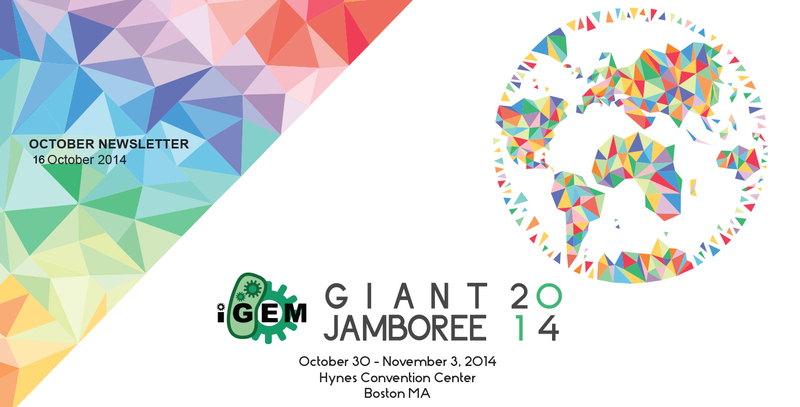 Online registration is closed but you may contact HQ at iGEM dot org for further assistance. While we need to enforce strict access control because of the venue, we must also do this because this practice does not respect iGEM and the teams who follow the rules and have registered properly. We trust and respect our community and expect other to do the same.